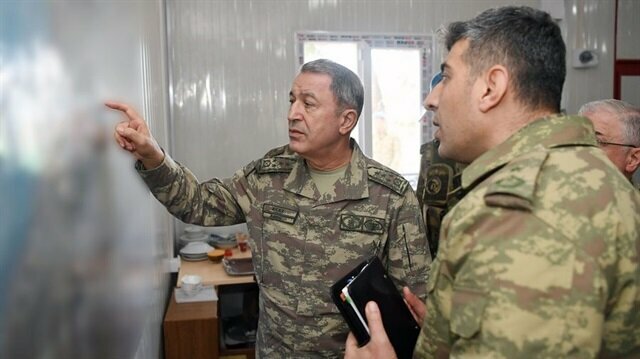 Turkey's Chief of General Staff Gen. Hulusi Akar on Monday paid a visit to the border province of Hatay to inspect troops who are taking part in Operation Olive Branch in Syria's Afrin. Hatay is across the Syrian border and is within the firing range of the Kurdistan Workers’ Party (PKK)’s Syrian branch, the PYD, from Afrin, which has been a major hideout for the PYD/PKK since July 2012, when the Assad regime in Syria left the city to the terror group without putting up a fight. Cross-border attacks by the PYD/PKK terror group in southern Turkey started as the Turkish army operation in Syria’s northwestern town of Afrin continues. Operation Olive Branch was initiated on Jan. 20 in Afrin to establish security and stability, eliminate PKK/KCK/PYD-YPG and Daesh terrorists, and save locals from their oppression and cruelty. 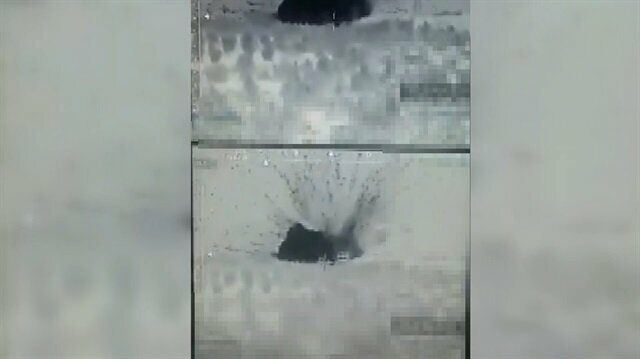 The Turkish military successfully destroyed terror targets with six shots from tanks amid Operation Olive Branch which was launched to eliminate Daesh and PKK/YPG terror elements from Syria's Afrin. Turkey’s Gendarmerie and Police Special Forces entered Syria’s Afrin via the Kilis Gülbaba and Hatay Hassa border on Monday. The teams entered Afrin to engage in residential operations. A total of 2,059 PYD/PKK and Daesh terrorists have been neutralized since the launch of Operation Olive Branch in Syria's northwestern Afrin region, the Turkish General Staff said in a statement on Monday.Operation Olive Branch was initiated on Jan. 20 in Afrin to establish security and stability, eliminate terrorists of PKK/KCK/PYD-YPG and Daesh, and save locals from the terrorists’ oppression and cruelty. The Turkish Armed Forces (TAF) and Free Syrian Army (FSA), rapidly liberated border towns from terror elements as part of Operation Olive Branch. TAF and FSA forces joined the Bulbul-Rajo line, as they captured the villages of Shaykh Muhammad, Kunda Dudu, Samalik, Velikli, Kavanda, Maydan Akbis, Bandirak, Kusanli, Arabli and Taban located northwest of Afrin. This enabled the forces who joined the operation from Azaz to unite with those who joined from Rajo.Turkish troops and the FSA captured ten villages in a single day on Sunday, effectively cutting off the PKK’s connection to Turkey on the Kilis-Hatay line completely. A small pocket along the Jinderes-Sheikh Hadid line remains under the control of the terror group, however it is only a matter of time before the Afrin operation clears that region.Since the launch of the operation on Jan. 20, Turkish military and the FSA liberated 112 locations including one center of a district, 84 villages, 20 strategic mountains and hills and one YPG/PKK-Daesh base.A total of 2,059 PYD/PKK and Daesh terrorists have been neutralized since the launch of Operation Olive Branch in Syria's northwestern Afrin region, the Turkish General Staff said in a statement on Monday.2,059 terrorists 'neutralized' in Afrin operationTAF, FSA approaches MaydankiOnce the border line is cleared of terrorists, operations targeting residential areas in the Jinderes, Rajo and Sheikh Hadid areas will be launched. It is believed that the Gendarmerie and Police Special Forces teams may launch an operation at any given moment.The strategically-located Jinderes was struck with warplanes overnight. Terrorists are fleeing mainly to Maydanki in the face of Operation Olive Branch. TAF and FSA forces, which have advanced to the north of Maydanki Dam, were faced with intriguing scenes at the Omranli village.Clashes at terror campFSA fighters who captured a PKK terror camp in Omranli engaged in intense clashes with the terror group. The FSA entered the training camp and saw a rock-monument with the name “Apo,” the nickname of PKK ringleader Abdullah Öcalan, written on it. FSA forces destroyed the effigy and seized documents of the terror organization.The PKK is listed as a terrorist organization by Turkey, the European Union and the United States. The PKK has been conducting armed violence in the southeastern part of Turkey since 1984. The PYD and its military YPG wing are Syrian branches of the PKK.Video: Footage emerges of intense clashes between FSA, YPG/PKK amid Afrin opSix hundred 'Kurdish Hawks' fighters to join Afrin operationThe Kurdish Hawks Brigade, part of the FSA, will join Turkey's Operation Olive Branch launched against YPG/PKK and Daesh terror organizations in Afrin, northwestern Syria.The brigade, which was formed by the Hamza Division, includes 400 Kurdish fighters from Azaz and 200 Arab forces, also known as “red berets.” Fighters of the brigade will be deployed to Afrin on Monday. Operation Olive Branch was initiated on Jan. 20 in Afrin to establish security and stability, eliminate terrorists of PKK/KCK/PYD-YPG and Daesh, and save locals from the terrorists’ oppression and cruelty.Afrin has been a major hideout for the PYD/PKK since July 2012, when the Assad regime in Syria left the city to the terror group without putting up a fight.Video: Kurdish FSA unit set to join Turkey's Operation Olive Branch in Afrin600 'Kurdish Hawks' fighters to join Afrin operationUN cease-fire in Syria not to affect Turkey's Afrin op.